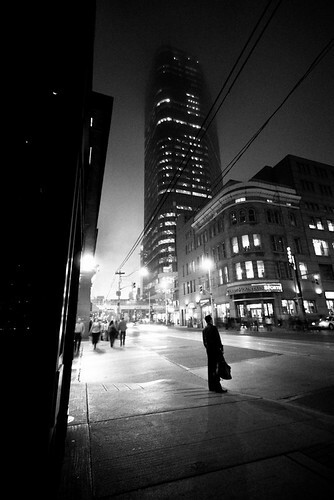 Night Photography in Downtown Toronto - South East Corner of Yonge St. and Queen St. The following shots were taken almost two years ago with a Nikon D80 and the Sigma 10-20mm (I miss that lens). When I took them I knew they had potential but it wasn't until now that I was able to bring my vision to life with the help of Nik's Silver Efex Pro (I love Nik's software:Viveza, Color Efex Pro and Silver Efex Pro). Both shots were taken with the camera set on a tripod as the Sigma is terribly slow in low light. 1. Coming home from work and some grocery shopping. RAW conversion in Adobe Lightroom, Pro Contrast Applied in Color Efex Pro, then bleach Bypass with modifications, and finally Silver Efex Pro. 2. Waiting for the light to turn. RAW convesion in Lightroom, Pro Contrast in Color Efex Pro, then Silver Efex Pro.